Protein, carbohydrates & fats have received plenty of attention in the health & medical industries over the past 20 years, with Drs & diet gurus telling us to ‘eat less fat’, ‘increase complex carbs’, ‘increase protein’ & then ‘eat more fat’ ‘decrease carbs’ & ‘eat less animal protein’….it’s confusing & exhausting just trying to keep up with research & changing opinions! Many of us health-conscious people now have a substantial collection of conflicting dietary advice books, largely focussed on fat, carbs & protein….but fibre has been quietly sitting in the corner waiting its turn – left out of the equation & only seen as important for constipated folks. It makes sense – we humans can’t actually digest fibre. It’s obviously not that important to our health if we can’t break it down into anything usable, right?…it’s just good to keep everything moving through the bowel, right? WRONG! It seems as though fibre will finally start getting the massive attention it deserves, now we’re discovering all the links between our gut microbes & health. Did you know that your fibre intake can influence everything in the list below? And this is just a very basic short list, there are many, many more. How Does Fibre Effect Your Gut Health? The reasons it can help with the above list are complex – but basically, fibre helps to improve your ‘internal ecosystem’ (specifically your gut microbial diversity & abundance). 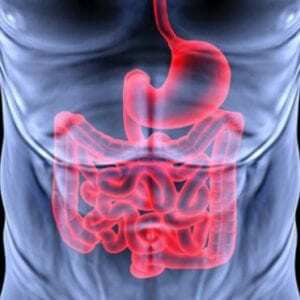 Our gut bugs eat whatever makes it through into the large intestine intact (i.e. fibre), & when they are well fed every day – they do all kinds of great things for us. Our gut is like an internal compost heap, & the rest of our body the garden. When our gut is working well it can generate a lot of goodness to nourish & heal our body, & when it is not working properly – the entire system will struggle. The research on this topic is fascinating, & will completely change the way we look at food, medicine & health over the coming years. Quick! Get Me Some Fibre, Any Fibre Will Do!! Not so fast. Before you reach for the ‘All-Bran’, you need to know that DIVERSITY is really important with your fibre intake. The old approach of using a single source fibre supplement (i.e. bran, psyllium, inulin etc) may help you to become more regular, but is not optimal to support overall good gut health & microbial balance (which is a foundation of good overall health). You can’t just ‘fix’ a low fibre diet with a few tablespoons of some supplement! It’s like relying on just one type of vegetable for your vitamins & minerals, instead of eating a variety – you’ll miss out on so many nutrients & end up really unbalanced. We carry (in our large intestine) many different types / strains of fibre-loving microbes, & they all have different food preferences. Relying heavily on one type of fibre will create an unbalanced population as you overfeed some of these critters, but neglect to feed the rest – so you end up with an overproliferation of the ‘few’ who love & thrive on all-bran, or psyllium, or inulin, or prunes, or whatever – & these guys can take over / over-crowd the gut ecosystem leaving little room for the rest. 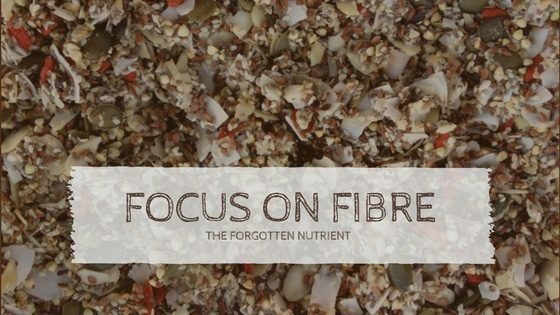 The key is to eat plenty of fibre daily, & ensure that you are getting it from loads of different kinds of plants – ie a variety of fruits, vegetables, nuts, seeds, legumes, seaweed, herbs & other plant fibre sources with diverse polysaccharides (parts of the plant that we cannot digest in the upper GI tract, but that will become food for our microbes in the bowel). Hint – these are not found in the refined foods that we’ve become accustomed to over the past 50 years! Refined sugars & starches tip the balance in the wrong way – they support the growth of the bad guys. Not to mention the gut bacterial impact of things like preservatives, artificial sweeteners, emulsifiers etc…these additives may have been ‘tested safe for human consumption’ but unless we know how they are impacting our gut ecosystem – how can we really know their long-term effects? The indirect health impact (through our gut bugs) may in fact be quite significant. The point is – we need to keep our diet as natural as possible, & include a good variety of nutritious plants to keep our gut bugs well fed, & balanced, thus maintaining a thriving internal ecosystem. Unfortunately, the opposite is generally true. The average westerner eats too many refined carbs, a lot of sugar & poor quality fats, plenty of artificials with very limited fermentable fibre – sourced from only a few different types of unrefined plants (a token daily apple or lettuce & tomato on their lunchtime burger). This means we are providing copious amounts of simple carbs / sugars to feed the ‘bad guys’, & very little roughage for the good guys in the bowel. As a result, there is precious little fermentation happening in the large intestine, which is one of the absolutely vital keys to good health – fibre is the fermentation material needed by our bowel bugs – they convert complex carbs (from fibrous foods) into SCFA’s (short chain fatty acids), which are potent anti-inflammatory substances & key nutrients for maintaining the health & integrity of the gut lining – among many other things (worth reading up on). My Own Internal Anti-inflammatory Factory?? Gut bugs + diverse fibre = home-made anti-inflammatories = better health & happiness = yay! When you think about inflammation as a cause / key contributor in almost all modern disease states – it makes really good sense to be feeding our own ‘anti-inflammatory generators’ with diverse fibre, every day, as a priority. It has even been questioned whether just adding a heap of plant fibre to a junk food diet can somewhat mitigate the damage / inflammation caused by the junk in this way…questioned, but not proven. The less processed our food is, the more likely that it will make it through our stomach & small intestine undigested, which may sound like a bad thing… BUT, it is these undigested fibrous foods that become food for our friendly helper-bugs! I.e. raw veg are better for the bugs than cooked, whole grains better than refined flour… we seem to do best on a combination of really unrefined foods & some more refined / easier to digest stuff, but experts believe the modern diet is much too far towards the ‘easy to digest’ processed end of the spectrum. If your gut is not super-sensitive / already out of whack, do an experiment on yourself by increasing your intake of unprocessed plant foods (making sure to focus on diversity), & just see what happens. Go slowly to transition comfortably – increase your intake gradually over time rather than all at once, or you may initially become bloated, gassy, uncomfortable & possibly constipated as your unprepared, unpopulated gut struggles to deal with the sudden influx of fibre. Over a few days / weeks though, your population of bacterial fibre-munchers should increase hugely & become much more healthy & diverse. Take note of how this effects you – look for changes in regularity / gut symptoms, body composition / weight-loss, mood, brain function, skin, immunity, aches & pains…it’s such an easy experiment with massive potential gains! If you feel that there’s no way you can tolerate fibrous foods due to severe gut symptoms – look into the low FODMAP diet. This can help many with IBS / gut issues to uncover the foods that are setting off their pain / bloating / gut symptoms. Remember that every gut is different, & the high fibre diet that works well for your neighbour might make you feel awful. This can be because you & your neighbour both have different digestive systems & gut bacterial populations. You may have lots of bean-loving bugs, but your neighbour may have very few, so she may feel uncomfortable after a big bowl of high-fibre hommus & celery sticks whereas you can thrive on it. Maybe apricots are ok for your neighbour but give you diarrhoea. Different fibre will have varying effects on different people, & sometimes it’s all in the dose. If you’re not used to a particular food, or way of eating – make changes gradually to ensure a smooth transition, or get some help from a professional to start with. So introduce slowly, find out what works for you, & enjoy the whole-body benefits of eating more fibre! 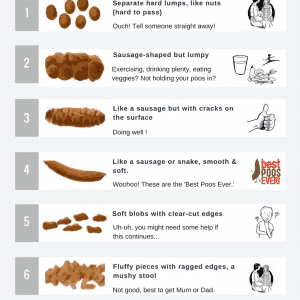 Print out this Bristol Stool Chart and laminate for the toilet door, & leave it there until your kids know exactly what they should be doing (or pooing) each day, & the many reasons they might go off track. You could save them from a heap of pain, stress & money later on in life by teaching them the importance of gut health. Click the image to get the free chart. This entry was posted in Gut Health and tagged blend11, bristol stool chart, constipation, fibre, fix your gut, FODMAP, gut bugs, gut health, microbiome, naturopath, prebiotic.